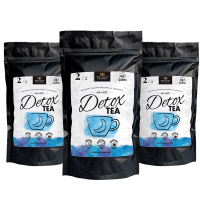 3x DETOX TEA FOR THE NIGHT - Natural dermocosmetics and dietary supplements. Collagen creams. A tea with a relaxing aroma, which supports proper digestive functions1. Detox Tea for the night – A tea with a relaxing aroma, which supports proper digestive functions1. 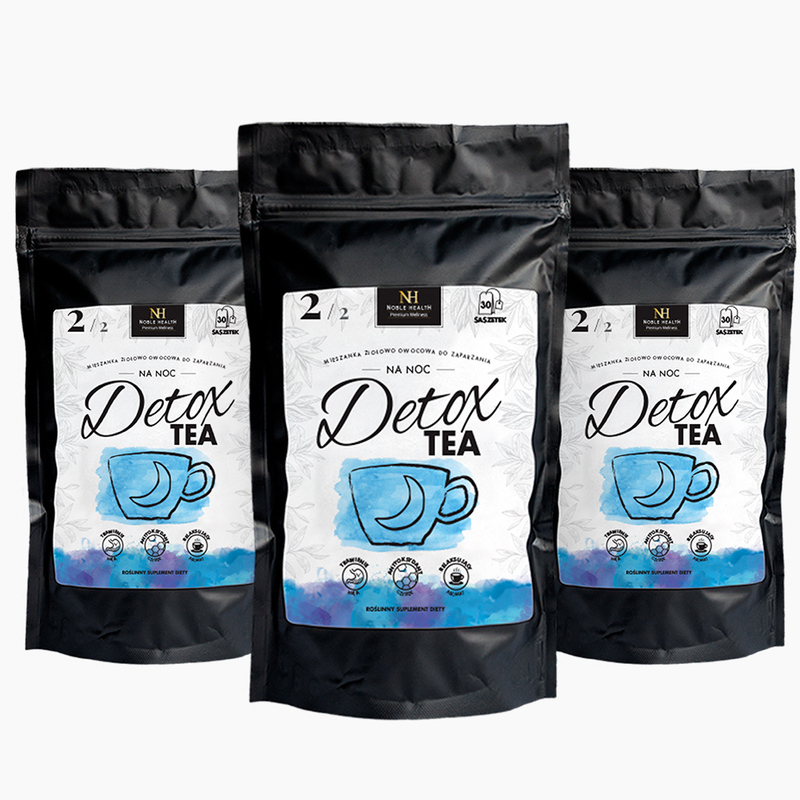 DETOX TEA for the night is a natural dietary supplement in a blend consisting of herbs and fruits. Our tea has a relaxing aroma and each teabag contains ingredients such as mint leaves, cistus, camomile flowers, lemon grass, orange skin, and fennel fruit. DETOX TEA for the night is a complementation of the DETOX TEA for the day. Silence your emotions, drink a delicious tea and sleep well! Ingredients: mint leaves (Mentha piperita L), rooibos (Aspalathus linearis), cistus (Cistus incanus L.), camomile flowers (Matricaria chamomilla L.), lemon grass (Cymbopogon citratus), orange skin (Aurantium dulcis pericarpium), fennel fruit (Foeniculum vulgare L.), caraway seeds (Carum carvi L.), aroma. 1. Who should drink DETOX TEA for the night? 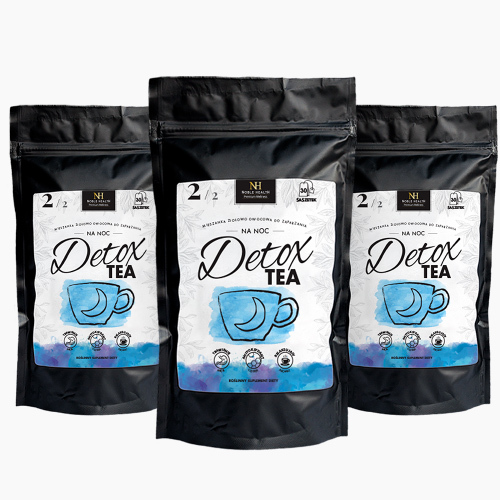 DETOX TEA for the night is a natural dietary supplement in a blend consisting of herbs and fruits. The product was designed for people who want to improve their digestive functions (mint). 2. What are the ingredients of DETOX TEA for the night? The ingredients of the product are: mint leaves (Mentha piperita L), rooibos (Aspalathus linearis), cistus (Cistus incanus L.), camomile flowers (Matricaria chamomilla L.), lemon grass (Cymbopogon citratus), orange skin (Aurantium dulcis pericarpium), fennel fruit (Foeniculum vulgare L.), caraway seeds (Carum carvi L.), aroma. 3. How do the ingredients of DETOX TEA for the night work? Mint leaves support the proper functioning of your digestive system. Cistus leaves help to protect cells from oxidative stress. Fennel fruits have antioxidant properties as well as improve the functioning of your immunity system. 4. How should I use DETOX TEA for the night? A teabag of DETOX TEA for the night should be brewed in a temperature below 100 Celsius degrees. The drink is ready after 2-3 minutes. It is recommended to drink 1 tea in the evening, after the last meal. During the day, you should drink DETOX TEA for the day. You should not exceed the recommended daily dose during the day. Dietary supplements should not be used as a substitute to a varied and balanced diet – which is a prerequisite for good health. A daily dose delivers ingredients in amounts that provide the declared health benefits. 5. How should DETOX TEA for the night be stored? The product should be stored in room temperature. Keep it away from damp places and out of reach of small children. 6. How many teabags are within one DETOX TEA for the night? In one package there is 30 teabags. 7. What is the Net mass of one product? The net mass of the product is 60g. I'm a young mom and I have to admit that I constantly complain about lack of time and I have no strength for weight loss. I decided to try both teas and I see the difference - better digestion, dresses fit nicely and the ankles are no longer swollen. I did not expect such effects! I like both teas the one for the day and for night - they taste great, they work effectively but gently - beautifully the water came down from me! wow! As a guy I have to admit that it tastes cool and does work OK, I like it!